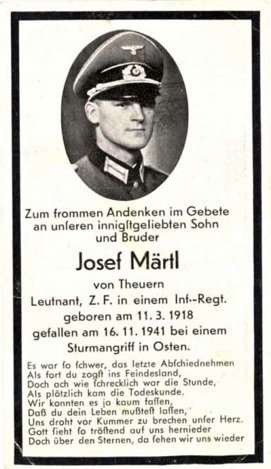 WW2 German Death Card (Sterbebild) for Army Leutnant Josef Maertl, Platoon Leader in an Infantry Regiment. From Theuern. Killed in an offensive assault in the East, 16 November 1941. He was 23. Single page single sided card measures about 2.5 x 4.5 inches. Back of card has a crucifix. 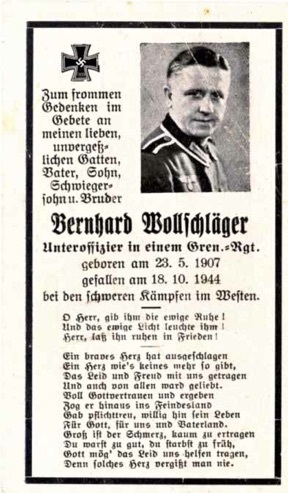 WW2 German Death Card (Sterbebild) for Army Unteroffizier Bernhard Wollschläger, Grenadier Regiment. Killed fighting in the West, 18 October 1944. He was 37. Back of card has a rendering of Jesus. The single page, single sided card measures about 2.25 x 4 inches. Includes slip from the German Graves Office listing him as dieing at the main aid station Ranspach and being buried in Cernay, France. In good condition with 2 bends. 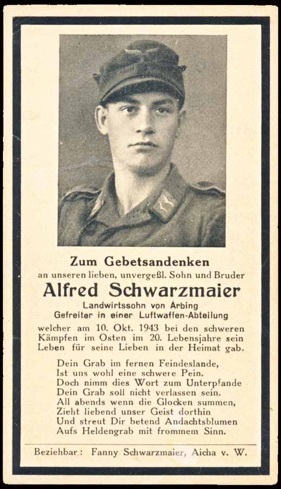 WW2 German Death Card (Sterbebild) for Luftwaffe Gefreiter Alfred Schwarzmaier, Luftwaffe Abteilung. Killed on the East Front in difficult fighting, 10 October 1943. He was 20. The back of the card has a rendering of Mary. The single page, single sided card measures about 2.5 x 4 inches. 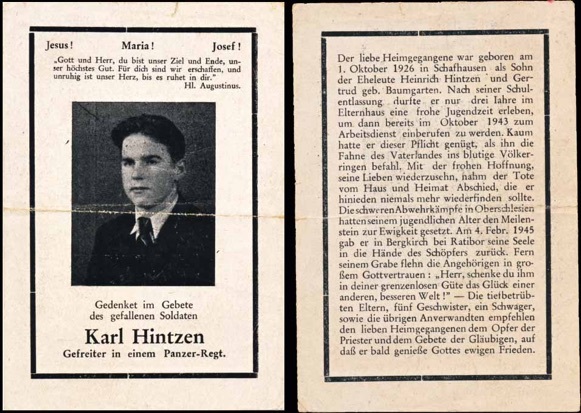 WW2 German Death Card (Sterbebild) for Gefreiter Karl Hintzen, Panzer Regiment. He went to the RAD in October 1943, and after, to the military.He was engaged in the difficult fighting repulsing the enemy in Bergkirch by Ratibor, when he was killed 4 February 1945. He was 18. He was a member of the 20 Panzer Division, engaged fighting the Red Army around Bergkirch and Ratibor from 1 to 16 February. The single page double sided card measures about 2.5 x 4.5 inches. Includes a slip from the German Graves Office listing him as killed at Bergkirch and buried in Slawikow, Poland. 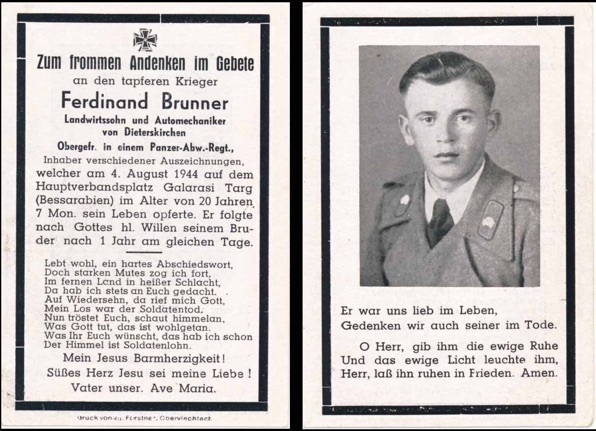 WW2 German Death Card (Sterbebild) for Obergefreiter Ferdinand Brunner, Panzer Abwehr Regiment. Died at the main aid station, Galarasi Targ Bessarabia. He was 20. He followed his brother in death, on the exact day, a year later. Nice photo in assault gunner tunic. 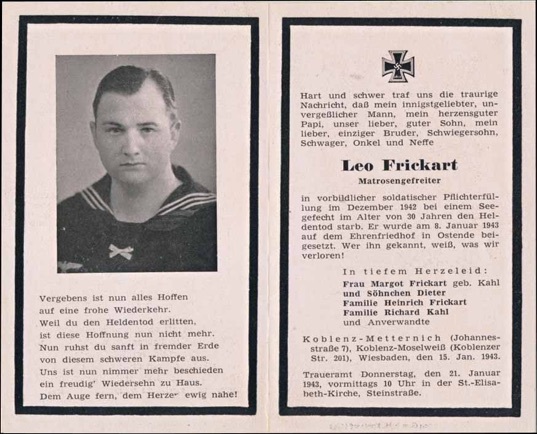 WW2 German Death Card (Sterbebild) for Kriegsmarine Matrosengefreiter Leo Frickart. Beginning his navy service in December 1942, he was killed 8 January 1943, at the age of 30. Buried in the cemetery at Ostende (Belgium). Frickart served aboard Sperrbrecher 178, Gauss, (built as a cargo ship and converted to a minesweeper). HMS Worcester or HMS Whitshed torpeoed the 178 and sank it north east of Dieppe, France. Torpedos were followed by gunfire and shelling. Includes a German Graves Registration slip and info on the 178. 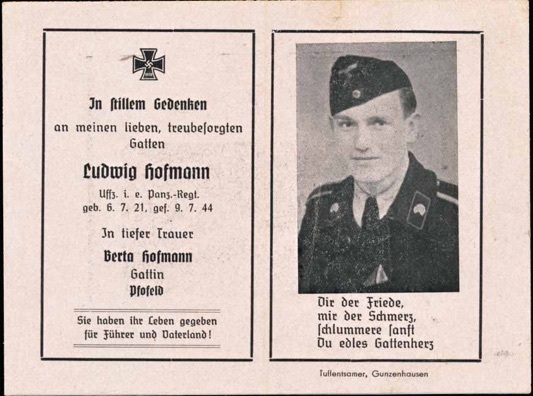 WW2 German Death Card (Sterbebild) for Army Unteroffizier Ludwig Hofmann, Panzer Regiment. Killed 9 July 1944. He was 23. Nice uniform photo wearing the Iron Cross and Russian Front ribbons. The double page, single sided card measures about 8 x 5 inches. Includes slip from the German Graves Office listing Ludwig as dieing with wounded transport unit 503 and being buried in Berjosa, Belarus. I am guessing the “503” was part of a heavy Panzer unit as well.